A Congolese health worker administers Ebola vaccine on Aug. 18, 2018, to a woman who had contact with an Ebola sufferer in the town of Mangina in Congo’s North Kivu province. On Tuesdays and Fridays, an estimated 19,000 people stream down the hill from Congo’s North Kivu province to cross the border into this small town, many of them headed to a sprawling open-air market. The latest Ebola outbreak, Congo’s 10th, was declared just a week after a smaller one was quelled in another part of the country. 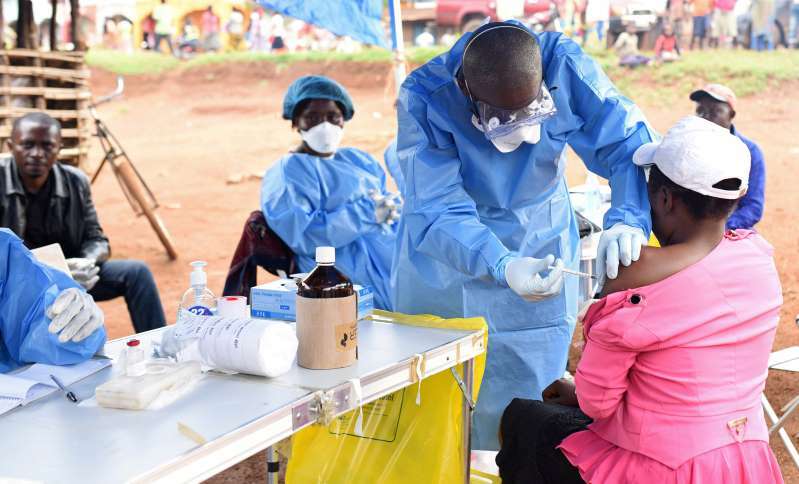 It comes four years after the Ebola epidemic in Liberia, Sierra Leone and Guinea killed more than 11,000 people, sickened more than 28,000 and sparked panic about travel in other parts of the world, including the United States. “Really, in two weeks, we’ve gone from 24 cases to 105 cases,” Redfield said, mainly because many health workers at a hospital in the town of Mangina, where the outbreak began, became infected when they treated early patients without recognizing that they had Ebola and therefore did not take adequate precautions. The disease spreads through contact with the bodily fluids of victims, putting health workers and patients’ family members at greatest risk. “In the next couple of weeks, we’ll have greater clarity” about the scope of the problem, Redfield said. “The scary thing is that we are above 100 cases already,” said Michelle Gayer, director of emergency health for the International Rescue Committee, a nonprofit organization that is helping in the region. But she said it will be another week before health authorities can begin to assess fully how bad the outbreak may become. “Everyone is concerned, rightfully so, that there are still cases coming,” said Karin Huster, emergency coordinator for Doctors Without Borders, who is in Beni, a city in the affected area of Congo. Several factors make this outbreak challenging. Years of conflict between militias and the government have put large numbers of people on the move and weakened the region’s health infrastructure. The instability also makes it difficult to travel to outlying areas where cases have been discovered, such as Oicha, without military protection. But unlike four years ago, when Ebola tore through a portion of West Africa, authorities now have a vaccine and several experimental treatments that were developed in the interval. Redfield said that nearly 3,000 people have been vaccinated, with 400 to 600 more receiving the vaccine each day. About a dozen confirmed cases have been treated with two experimental therapies, including one developed at the U.S. National Institutes of Health. All of the treated patients are alive, he said. Four years ago, the World Health Organization and the United States were accused of moving too slowlyto intervene in the West African epidemic. This time, both have moved quickly into the area. And Doctors Without Borders opened a 70-bed treatment center in Mangina on Aug. 14, while the Alliance for International Medical Action has a 40-bed center in nearby Beni. A third is being built, Redfield said. So far, Redfield said, it is not necessary to test travelers at U.S. ports of entry, in part because there are no direct flights to the United States from the affected region and screening of outgoing travelers is being conducted. Four years ago, debate raged about whether to cut off all travel from West Africa to the United States. President Trump, then a private citizen, was an outspoken advocate of that position, tweeting that the United States should not allow two infected American missionaries back into the country for treatment. Kent Brantly and Nancy Writebol were admitted to U.S. hospitals and survived after receiving intensive care. At the Congo-Uganda border crossing, Alphosine Kahindo, 47, was on her way to the market, a 12-hour trip on foot from her home in Kisima, to buy fish and soap and to sell a milky-white alcoholic drink made from fermented corn. She said that her uncle is sick and that her brother died in the current outbreak. She did not attend his funeral, she said, because of the fear of infection. “I was longing to go, but I couldn’t,” she said.